Reparation is a theological concept closely connected with those of atonement and satisfaction. In ascetical theology, reparation is the making of amends for insults given to God through sin, either one's own or another's. The response of man is to be reparation through adoration, prayer, and sacrifice. In Roman Catholic tradition, an act of reparation is a prayer or devotion with the intent to expiate the "sins of others", e.g. for the repair of the sin of blasphemy, the sufferings of Jesus Christ or as Acts of Reparation to the Virgin Mary. "The creature's love should be given in return for the love of the Creator, another thing follows from this at once, namely that to the same uncreated Love, if so be it has been neglected by forgetfulness or violated by offense, some sort of compensation must be rendered for the injury, and this debt is commonly called by the name of reparation". According to Thomas Slater, reparation is a theological concept closely connected with those of atonement and satisfaction, and is considered a sacred mystery in Roman Catholicism. It is the teaching of that faith that man is a creature who has fallen from an original state of grace in which he was created, and that through the incarnation, Passion, and death of Jesus Christ, he has been redeemed and restored again in a certain degree to the original condition. Although God might have condoned men's offences gratuitously if He had chosen to do so, yet in divine providence He did not do this; He judged it better to demand satisfaction for the injuries which man had done Him. It is better for man's education that wrongdoing on his part should entail the necessity of making satisfaction. This satisfaction was made adequately to God by the suffering, passion, and death of Jesus Christ, made Man for us. By voluntary submission to His passion and death on the cross, Jesus Christ atoned for man's disobedience and sin. He thus made reparation to the offended majesty of God for the outrages which the Creator so constantly suffers at the hands of His creatures. Man is restored to grace through the merits of Christ's death, which grace enables him to add his prayers, works, and trials to those of Our Lord "and fill up those things that are wanting of the sufferings of Christ, in my flesh, for his body, which is the church" (Colossians 1:24). Man can thus make some sort of reparation to the justice of God for his own offences against Him, and by virtue of the Communion of the Saints, the oneness and solidarity of the mystical Body of Christ, he can also make satisfaction and reparation for the sins of others. The idea of reparation is an essential element in the Roman Catholic devotion to the Sacred Heart of Jesus. In the seventeenth century, Christianity had seen some great profanations of the Blessed Sacrament, which renewed attention to the atonement dimension of adoration and gave rise to various societies for the Blessed Sacrament. In 1654 Catherine de Bar founded the Order of the Benedictine Sisters of Perpetual Adoration of the Most Holy Sacrament in Paris. Some Catholic organizations whose focus was reparation included the Archconfraternity of Reparation for blasphemy and the neglect of Sunday, founded by Bishop Pierre Louis Parisis in 1847; and the Archconfraternity of the Holy Face, founded by Venerable Leo Dupont in 1851. In 1886 Pope Leo XIII authorized the formation of the Archconfraternity of the Mass of Reparation in Rome. The Mass, the representation of the sacrifice of Calvary, was according to Thomas Aquinas specially suited to make reparation for sin. But some caution has been called for here following the impact of Scriptural studies on Catholic theology after the Second Vatican Council; notions of God's wrath that are more characteristic of the early Hebrew scriptures and of tension between the Father and the Son have yielded to a Trinitarian focus on "the self-offering of believers in union with Christ by which they share in his covenant relationship with the Father." 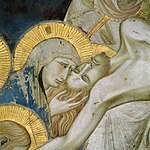 Fresco detail by Pietro Lorenzetti. the Rosary of the Holy Wounds (which does not include the usual rosary mysteries) focuses on specific redemptive aspects of Christ's suffering in Calvary, with emphasis on the souls in purgatory. the Act of Reparation to Jesus Christ and for the reparation of blasphemy is The Golden Arrow Holy Face Devotion (Prayer) first introduced by Sister Marie of St Peter in 1844. This devotion (started by Sister Marie and then promoted by the Venerable Leo Dupont) was approved by Pope Leo XIII in 1885.
the Act of Reparation to The Holy Trinity is based on the messages of Our Lady of Fatima and is usually called the Angel Prayer. Receiving Holy Communion as part of a first Friday devotion is a Catholic devotion to offer reparations for sins through the Sacred Heart of Jesus. In the visions of Christ reported by St. Margaret Mary Alacoque in the 17th century, several promises were made to those people that practiced the first Friday devotions, one of which included final perseverance. The devotion consists of several practices that are performed on each first Friday of nine consecutive months. On these days, a person is to attend Holy Mass and receive Communion. In many Catholic communities the practice of the Holy Hour of meditation during the exposition of the Blessed Sacrament during the First Fridays is encouraged. Some Marian apparitions have mentioned the need for reparation. The messages of Our Lady of Fatima also emphasized the need for reparations. According to the child seers, Mary asked them to make sacrifices to save sinners. The Prayerful Sodality was founded by Venerable Abbot Hildebrand Gregori in 1950. It became the Congregation of the Benedictine Sisters of the Reparation of the Holy Face in 1977. ^ In 1968 Enchiridion Indulgentiarum (EI) replaced Raccolta to comply with Pope Paul VI's 1967 Indulgentiarum doctrina. EI lists "only the most important prayers and works of piety, charity and penance" that have an attached indulgence. ^ Brown, Raymond E.; et al. (1989). NJBC. Pearson. ISBN 0136149340. ^ Kilmartin, Edward J. (1999). The Eucharist in the West, History and Theology. Collegeville, MN: Liturgical Press. pp. 381f. ISBN 0814661726. See also Robert Daly, “Sacrifice Unveiled or Sacrifice Revisited”. Theological Studies, March 2003 and Walter Kasper, The God of Jesus Christ. Crossroad (1986), pp. 191,195. ISBN 0824507770. ^ Stravinskas, Peter M. J., ed. (1998). "First Friday devotion". Our Sunday visitor's Catholic encyclopedia (revised ed.). Huntington, IN: Our Sunday Visitor. p. 428. ISBN 9780879736699. ^ "The Apparitions of the Blessed Virgin Mary in Akita, Japan, to Sr. Agnes Sasagawa". ewtn.com. Irondale, AL: Eternal Word Television Network. November 2011. Archived from the original on 2011-12-08. Retrieved 2015-09-13. Despite claims that Cardinal Ratzinger gave definitive approval to Akita in 1988, no ecclesiastical decree appears to exist, as certainly would in such a case. ^ "Hildebrand Gregori a step closer to canonization". zenit.org. New York: Innovative Media. 2007-07-17. Archived from the original on 2015-09-13. Retrieved 2015-09-13. This article incorporates text from a publication now in the public domain: Slater, Thomas (1911). "Reparation" . In Herbermann, Charles. Catholic Encyclopedia. 12. New York: Robert Appleton. This page was last edited on 11 October 2018, at 22:08 (UTC).